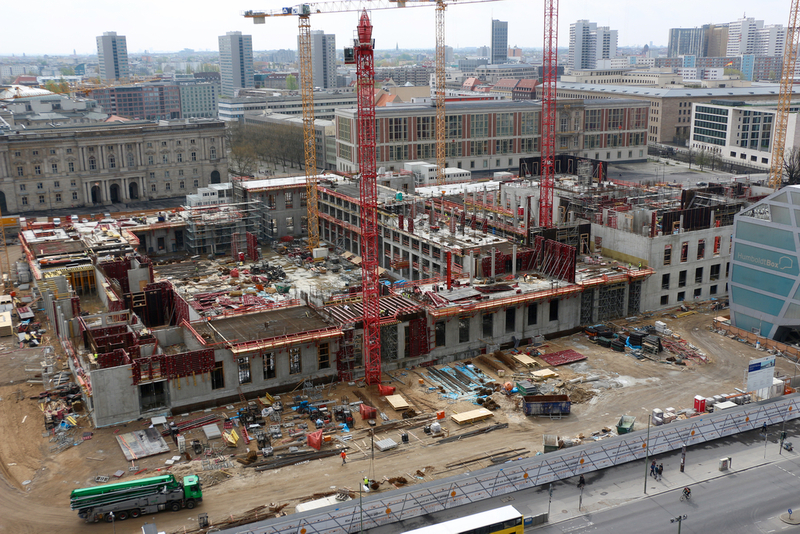 On 12 June 2015, Berlin’s new City Palace celebrated its topping out ceremony. Main entrance hall and cupola. Celebrating ‘Richtfest’, reaching a building’s highest point, is a German tradition. 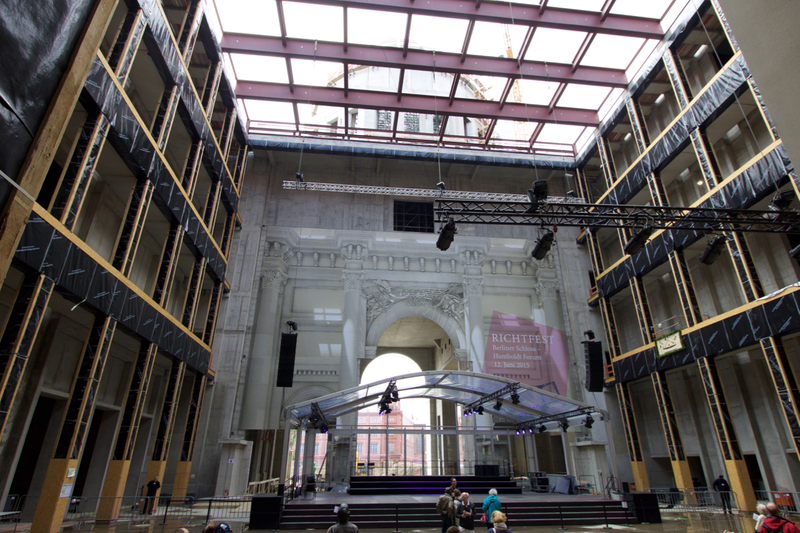 In the case of Berlin’s new Humboldt Forum, which we’re not supposed to call City Palace, the party arrived sooner than everyone thought, as the project is, shall we say, controversial. 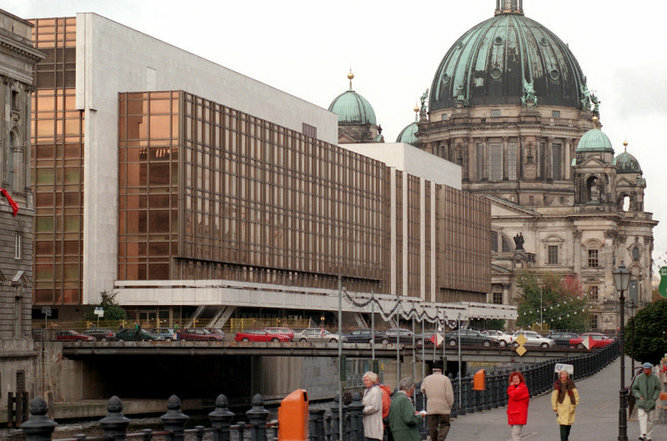 Many ostalgians prefer its predecessor, the GDR’s Palace of the Republic, ‘an architectural atrocity with orange windows and asbestos inside’, to quote The Economist. It was razed to the ground in 2008 to make way for the new City Palace Humboldt Forum. The Palace of the Republic in 1997, just before work started to remove its 5000 tonnes of asbestos. 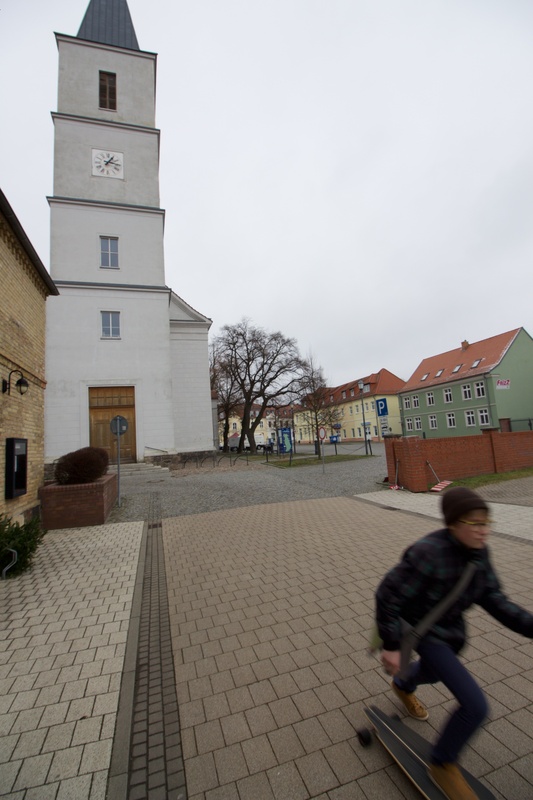 Pic: dpa. The historical to-and-fro on this site is ironic: first there was the old City Palace, built by Andreas Schlüter and Eosander von Göthe around 1700. Last monarch to occupy it was Wilhelm II, who fled into Dutch exile in 1918. Heavily bombed in World War II (but not unsalvageable), the government of the GDR considered the palace such a poignant symbol of Prussian tyranny that they blew it up in 1950 – keeping only one part: the ‘Liebknecht portal’ which contains the balcony from which Communist leader Karl Liebknecht proclaimed the German Soviet Republic on 9 November 1918. 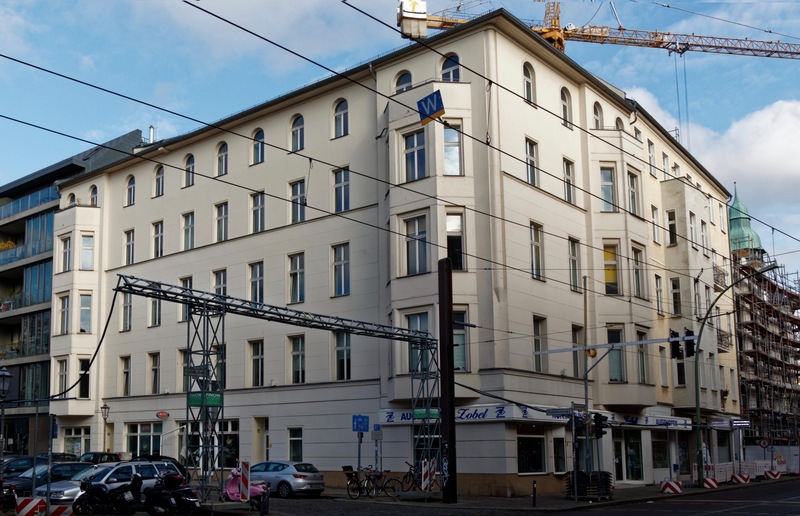 The portal was integrated in the Staatsrat building, Erich Honecker’s office, just across the road from where the palace had been. Then, in the 1970s, the GDR’s bronze glass and asbestos Palace of the Republic was built on the site previously occupied by the City Palace. As the GDR itself got confined to history, so did the Palace of the Republic, and things went full circle as construction of the new Humboldt Forum, a replica of the old City Palace, is now halfway completed. Funding of the Humboldt Forum project has always been precarious. 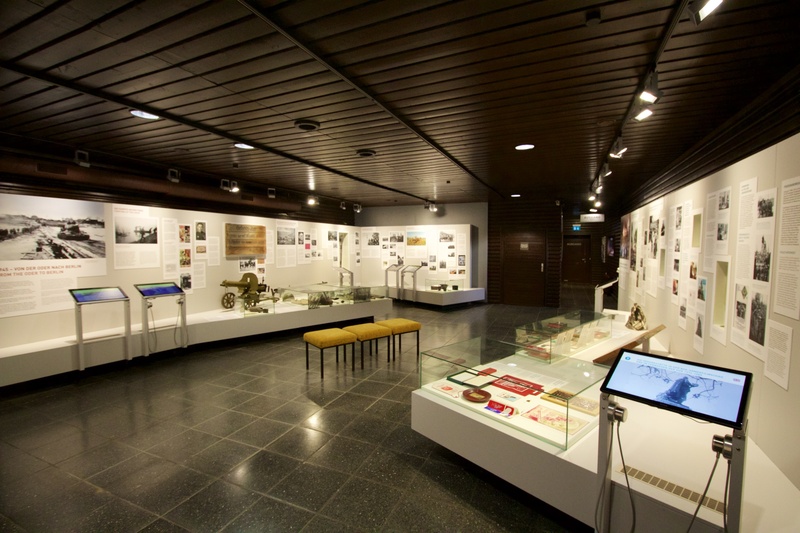 In the end, the German federal government agreed to foot the bill for the new ethnology museum that the palace will house and which had to be built anyway. But the cost of the baroque stonemasonry that will make the building look like its 1702 predecessor has to come from private funds, and the money isn’t fully there yet – hence the hearts and minds (and money) exercise organised over the weekend of 12 to 14 June 2015. 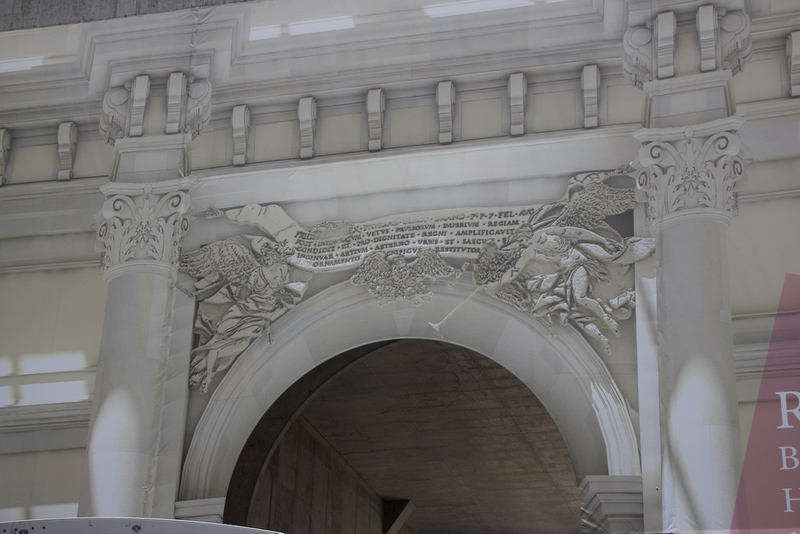 If all goes well, ironically, Berlin will have two Liebknecht portals (one on the Staatsrat, one on the Humboldt Forum), but no more communism. 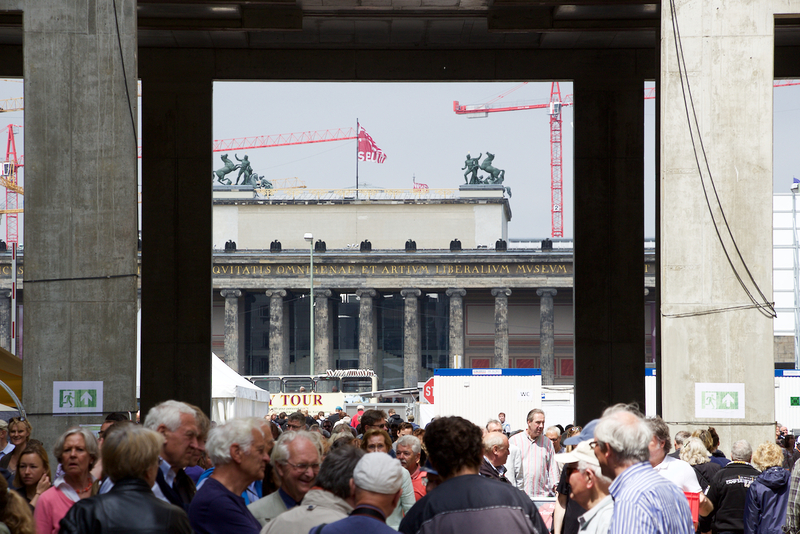 Most of the thousands of visitors to this weekend’s open house looked like Berliners – they certainly were different from the hordes of tourists in shorts and sunglasses hanging out in Lustgarten outside. Most people were over 50, conservatively dressed – West or East Berlin, or from outside the city? Hard to tell. 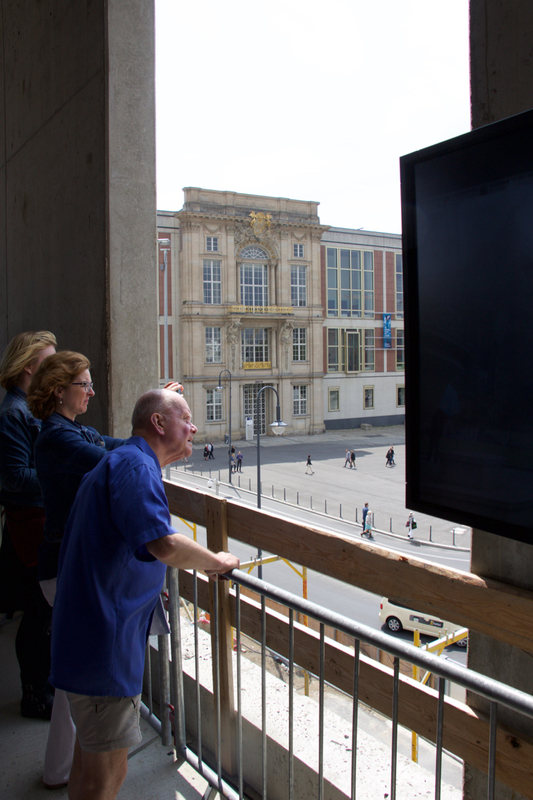 The building’s rough shell was interesting enough – but the views of its neighbours, like the Altes Museum, were spectacular. The fundraisers for the palace’s completion got ample exhibition space, but the open house wasn’t a begging exercise – access was free, and the collection boxes weren’t that conspicuous. If anything, the Humboldt Forum’s partners got pride of place. 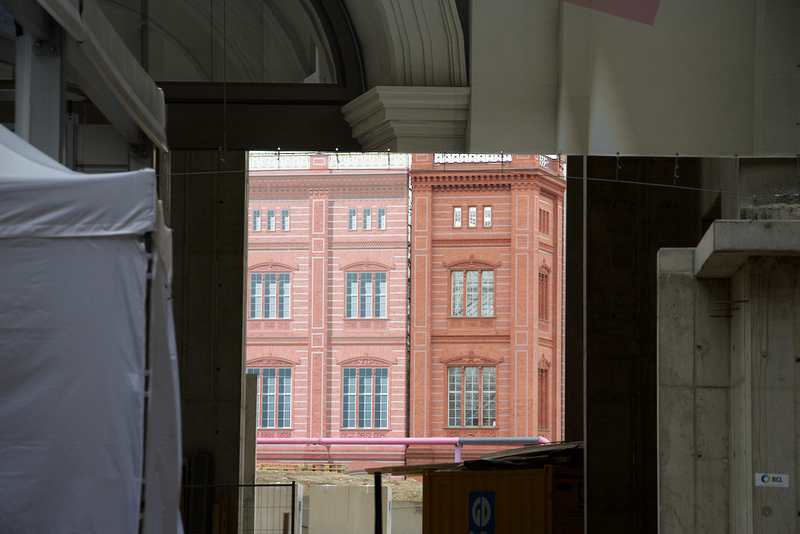 On each corner of the building, the neighbours got the opportunity to present themselves – the German Historical Museum across the road on Unter den Linden, the project to reconstruct Schinkel’s red-brick Academy of Architecture, the Foreign Office, the management institute that occupies the GDR’s former Council of State, and so on. Students from the Hanns Eisler music academy, which is housed in the Marstall, the stables and service building of the old City Palace, played jazzy big band tunes which fitted right in with the visitors’ demographics. Although touring the second floor would find you some non-standard catering, including an Israeli falafel stand, the main entrance hall of course contained the staple of any German festival: a bratwurst stand and a beer wagon. So far, so traditional. 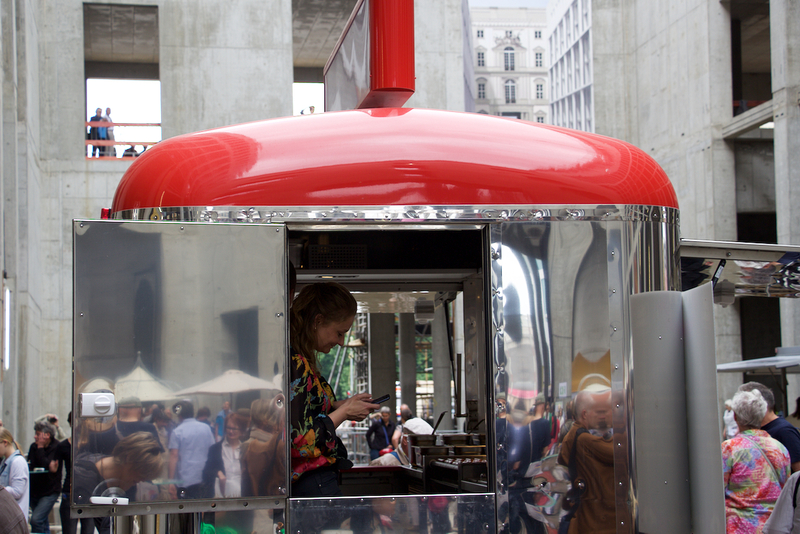 Can’t have a serious party without a bratwurst stand. Hard to say when the next time will be Joe Public can go see the City Palace. Maybe it will only be by the time the Humboldt Forum actually opens – and Neil McGregor, current director of the British Museum, connoisseur of all things German and curator of the excellent ‘Memories of a Nation’ exhibition, will have woven his magic wand over the Forum’s concept and content. Many displays showed how the building’s external stone masonry will be recreated – failing actual masonry, screen- printed cloth had to do! 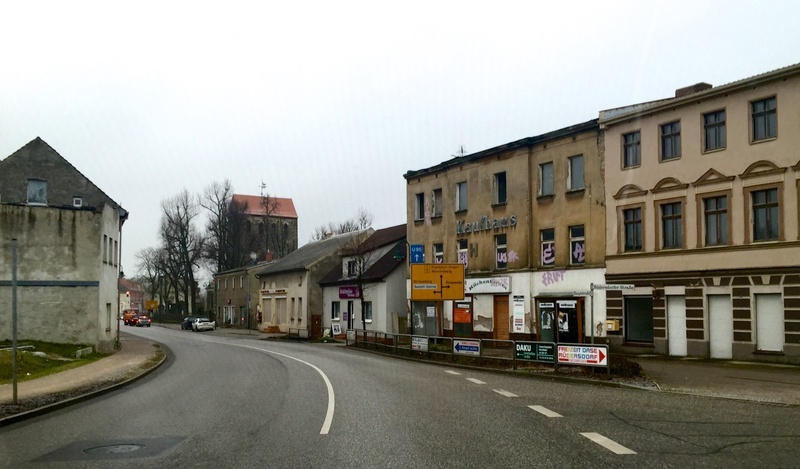 Follow the Strasse des 17. Juni all the way west from Brandenburg Gate and after about 10 km you will find yourself in the leafy area of Berlin’s West End. 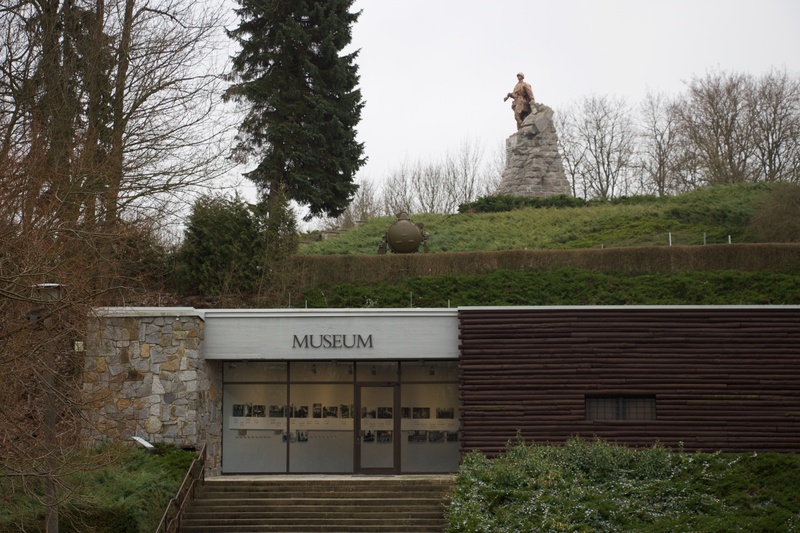 There are two poignant war memorial sites here: the 1936 Olympic complex with its Langemarck Hall, honouring the German dead of World War I, and the 1939-1945 Berlin Commonwealth War Cemetery. 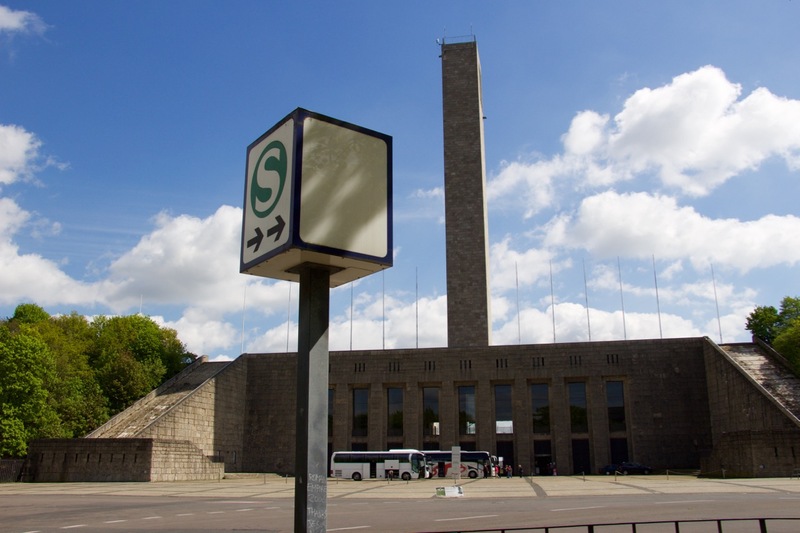 Berlin’s huge Olympic site in the West End is one of those projects, like the Autobahns, that are usually credited to Hitler but which were actually conceived in the era of the Weimar Republic. Hitler knew a good idea when he saw it but would normally add his own perverted twists. 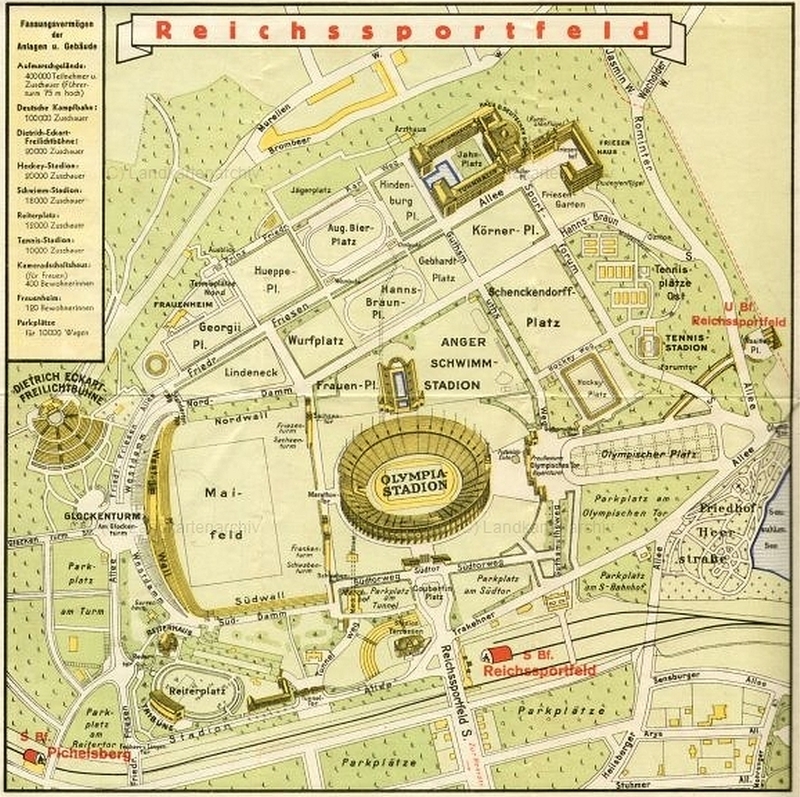 1936 map of the Reichssportfeld. Much of the site remains as shown here. In the case of the Reichssportfeld, this involved turning the original design for the Olympic Stadium, which was Bauhaus-inspired with lots of steel and glass, into the traditional Nazi design language of forbidding stone cladding and intimidating Doric columns. Hitler also added the Maifeld to the west of the stadium, a huge parade ground where the Party could marshal hundreds of thousands of people for mass gatherings, and an amphitheatre for open air performances (known as Waldbühne today and still used for performances). Then there was the Olympic Bell Tower (Glockenturm) overlooking the Maifeld and the Olympic Stadium (and much of the rest of Berlin besides – very much worth a visit!). Maifeld grandstands and Olympic Belltower. Fuhrer’s Lodge can be seen at the base of the tower. But the structure most telling of Hitler’s belligerent intentions, already as early as 1936, was the Langemarckhalle, at the base of the Bell Tower. 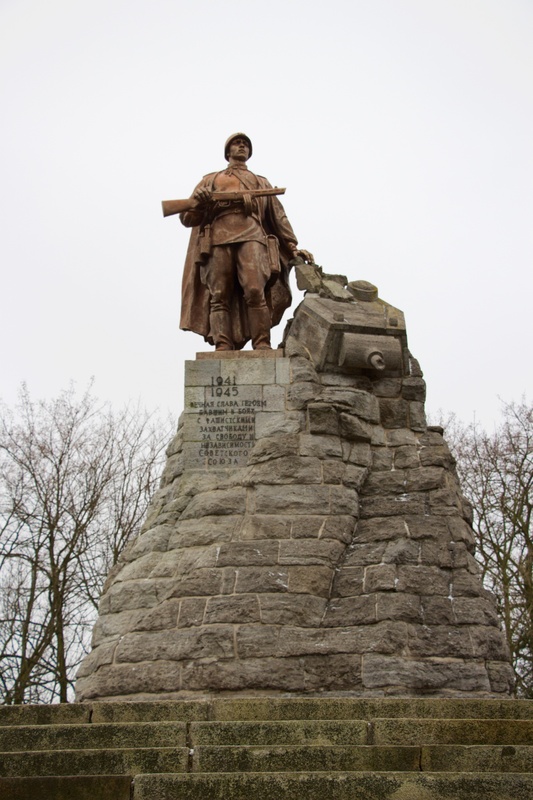 Langemar(c)k is the name of a Flemish village near Ypres, where one of the first entrenched battles of World War I took place in October 1914. 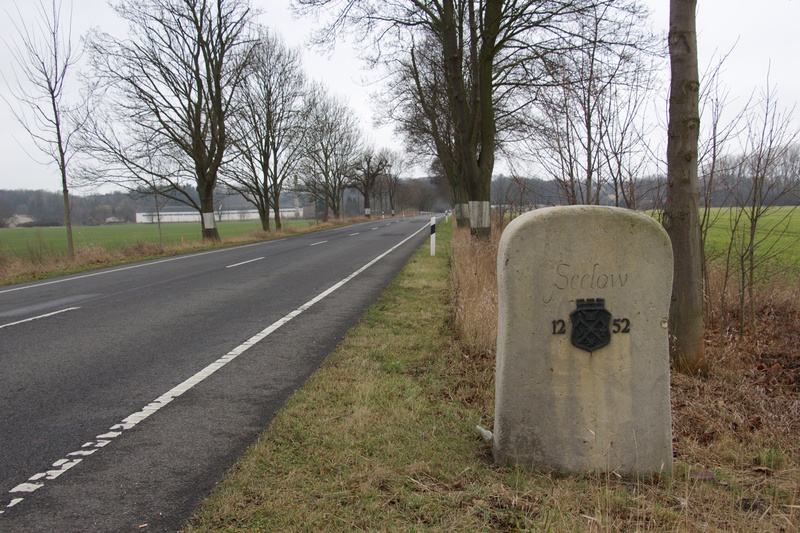 Many young German volunteers lost their lives, and in Germany the name became symbolic for the horrors of war but also for the heroism of the soldiers who died. 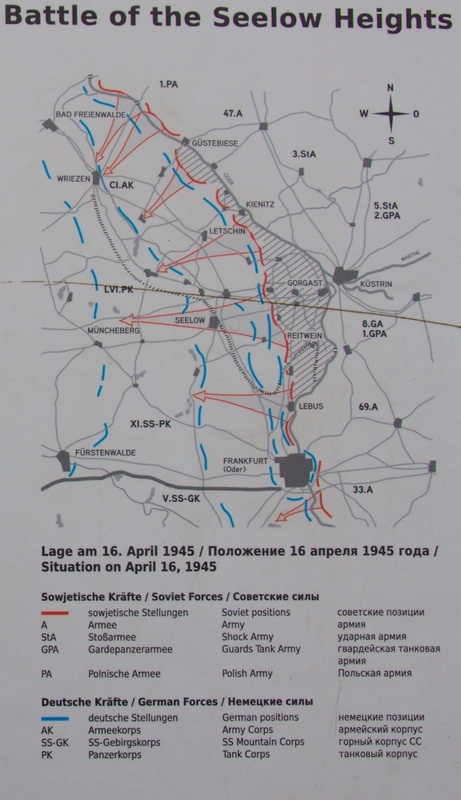 The Nazis used Langemarck in their propaganda whenever the topic of World War I arose – which it frequently did, as the platform on which the NSDAP had come to power was the shame of Germany losing WW I, and the Stab-in-the-back myth of Socialist and other mainstream parties agreeing the November 1918 armistice, where, if left to fight on, the German army could have won the war . 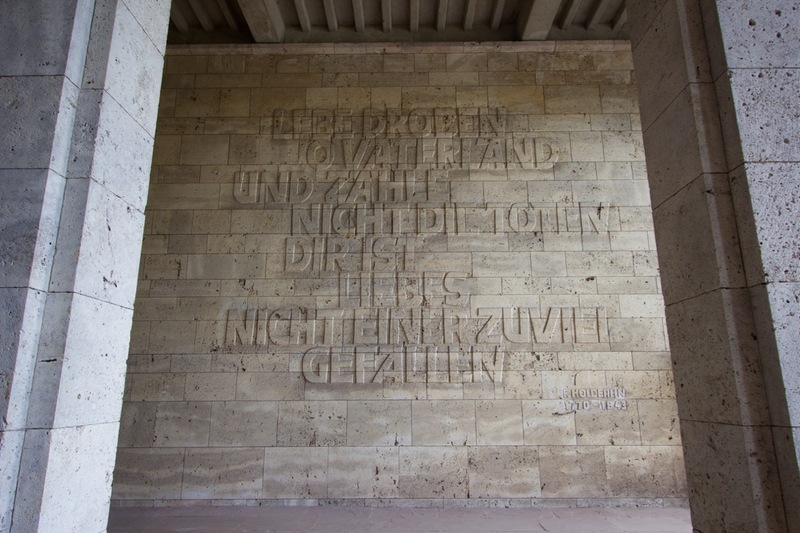 Friedrich Holderlin’s 1799 quote on sacrifice for one’s country – taken out of context by the Nazis – adorns one of the Hall’s walls. 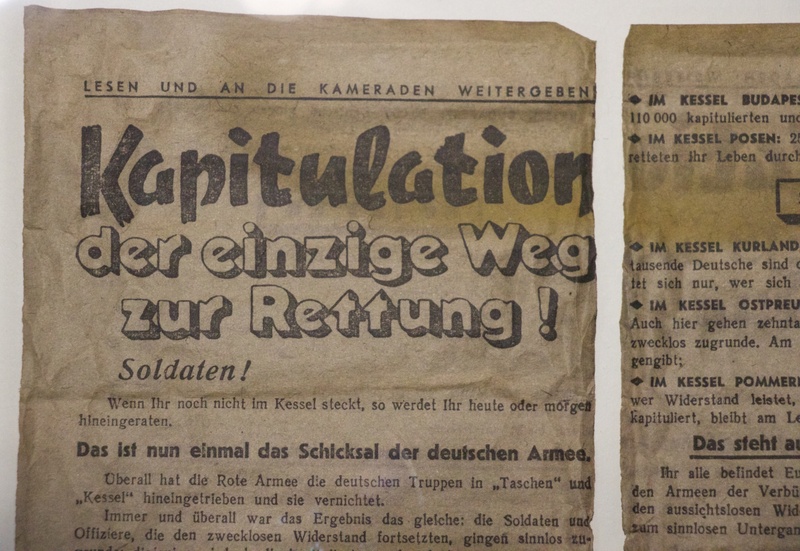 But in the runup to the 1936 Olympics, Hitler took Langemarck propaganda one step further in creating a direct link between sportsmanship and the heroism of fighting and dying in battle. By building this rather grim memorial to the dead of World War I at the centre of the Reich’s most prestigious sports facilities, he managed to frame the Olympics, for the German population at least, as a kind of preparation for the struggle to come. A different, and far more peaceful, kind of war memorial is the 1939-1945 Berlin War Cemetery, managed by the Commonwealth War Graves Commission. 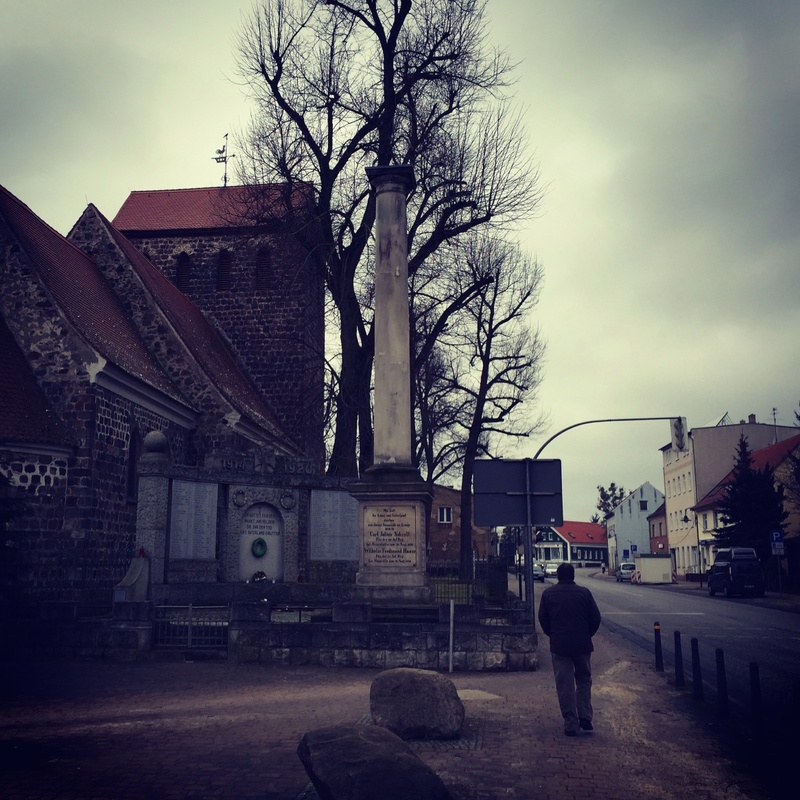 Just over a kilometre away from the Bell Tower, at the northern edge of Grunewald forest, this site is the central burial place for British and Commonwealth airmen killed over Eastern Germany, as well as for killed prisoners of war. Most of the fallen at this cemetery were bomber crews – the survival rate of flying staff in the R.A.F. was only 44%. Crews lie buried together whenever possible. 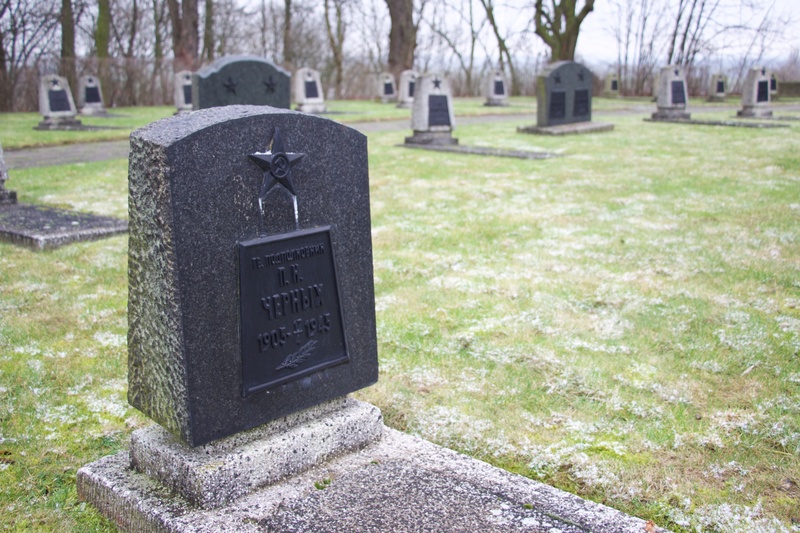 The cemetery was opened in 1945 and bodies of airmen were soon collected from all over Eastern Germany to receive their final resting place here, in what was then the British sector of West Berlin. 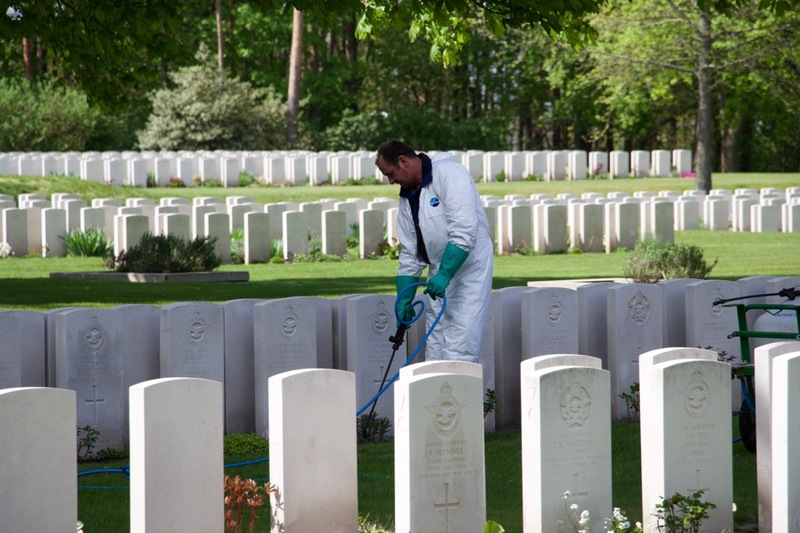 Commonwealth War Graves Commission gardeners tend to the cemetery. 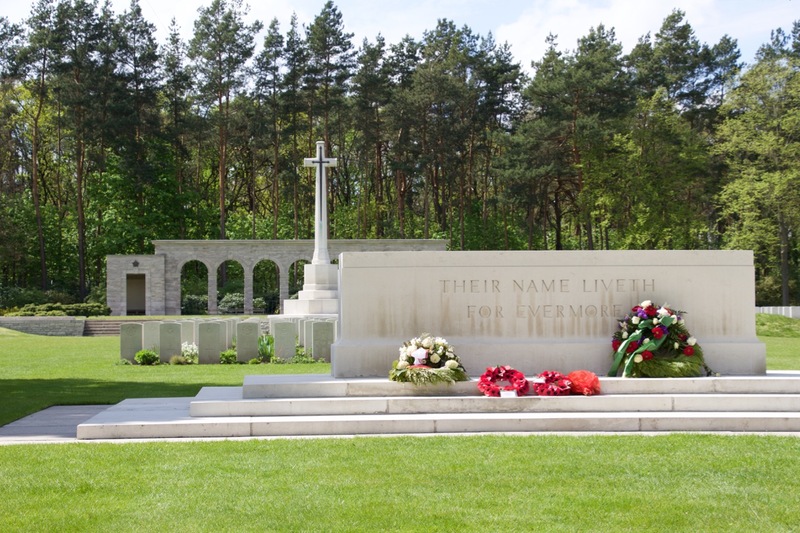 Visiting the cemetery is a familiar experience for anyone who has been to a Commonwealth war cemetery anywhere else – the same headstones, the same simple descriptions of rank and date of death, and often an inscription chosen by the dead man’s relatives. The grass and flowers are meticulously kept by the cemetery’s groundsmen, and the atmosphere is very much one of peace – sadness yes, but definitely peace, and gratitude for those that gave their lives. “Their name liveth for evermore” – Rudyard Kipling, who lost a son in World War I, was asked by the Commonwealth War Graves Commission to choose a suitable text for use in the cemeteries. He chose this quote from Ecclesiasticus. 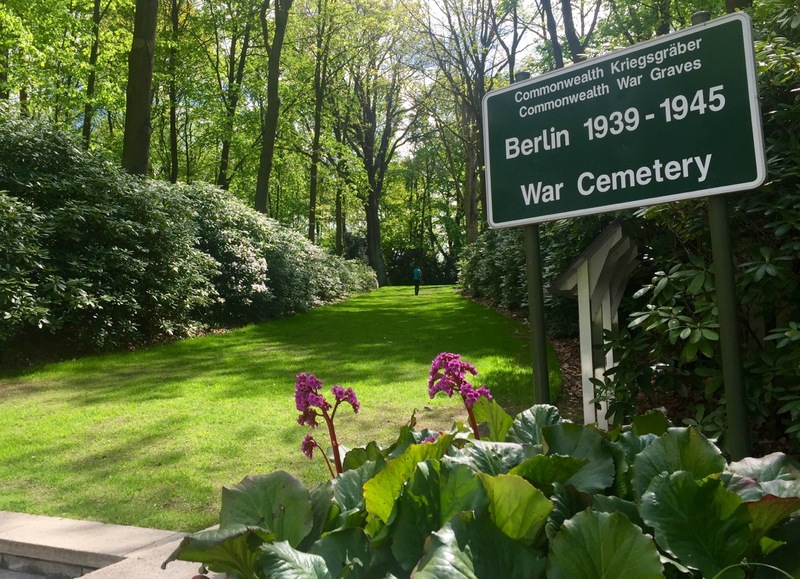 There couldn’t be a more different approach to honouring a country’s fallen soldiers than between the Langemarckhalle and the Berlin War Cemetery. 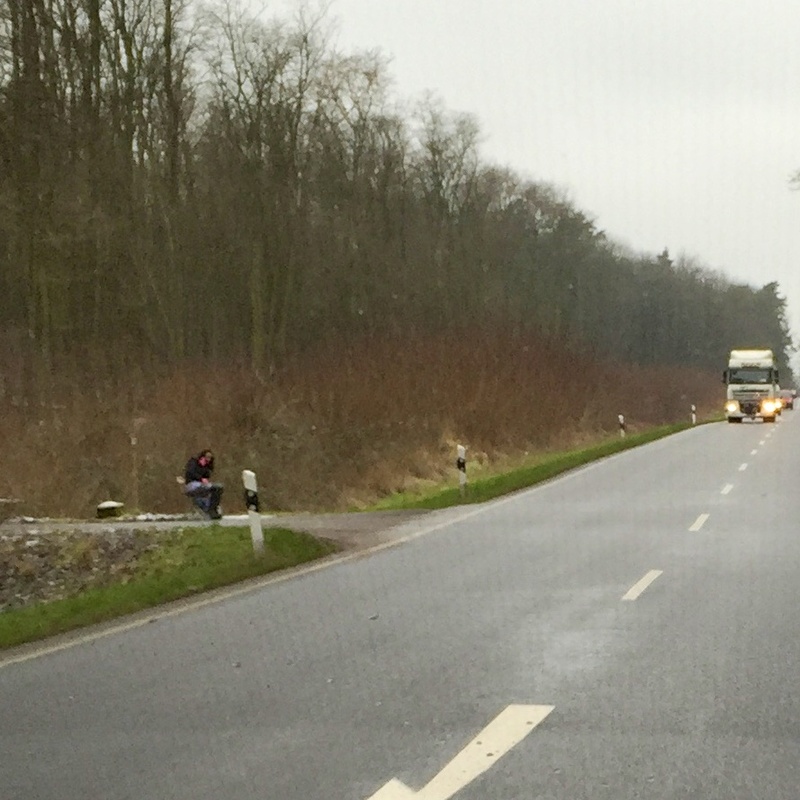 Visiting them together makes for a fascinating half day away from the bustle of central Berlin. 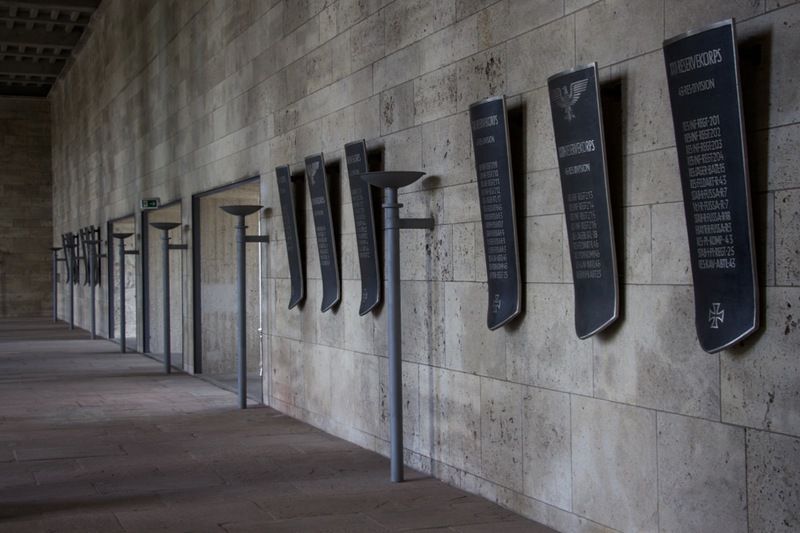 The stark contrast between the two memorials is a great reminder of the power and the dangers of propaganda, and clearly shows the difference between how democratic and totalitarian countries come to terms with their history. Bell Tower and Langemarckhalle: Am Glockenturm, 14053 Berlin, admission 4,50/2,50. 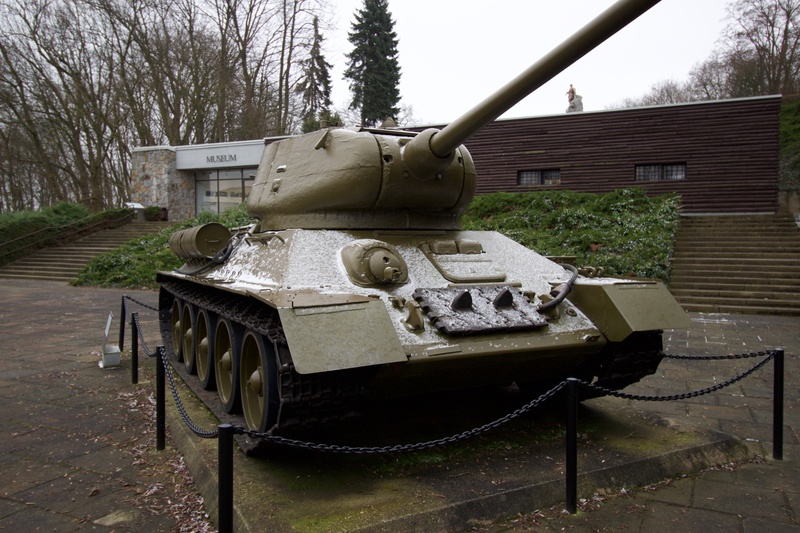 Berlin War Cemetery: Heerstrasse 139, 14055 Berlin. Both sites can be reached by S-Bahn S5 from Friedrichstrasse – get off at Pichelsberg, not Olympiastadion!